Hello! 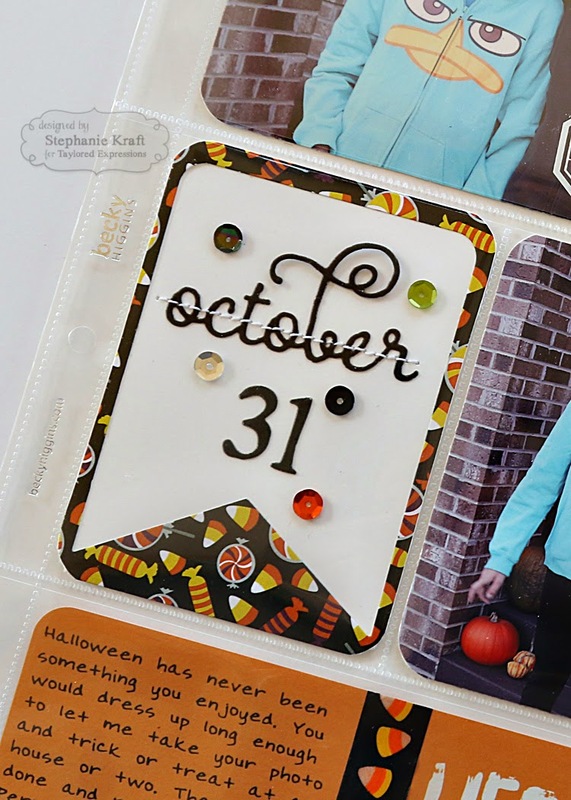 Today I have a Halloween page that I made for my Project Life 2014 album. Slowly, but surely, I'm filling in the gaps of my 2014 album. Here's a detail shot of one of the filler cards that I made using Pockets & Pages - October Script and Pockets & Pages - 3x4 Banner. The patterned paper is from the Hocus Pocus 6x6 Paper Pack and I've randomly added some Hocus Pocus sequins. Here's a shot of Brina coming down the stairs from one of the houses. It seemed like every house we went to had stairs, but she managed to navigate them pretty well when there was a rail or with Josie's help. "You're Fa-BOO-lous!" 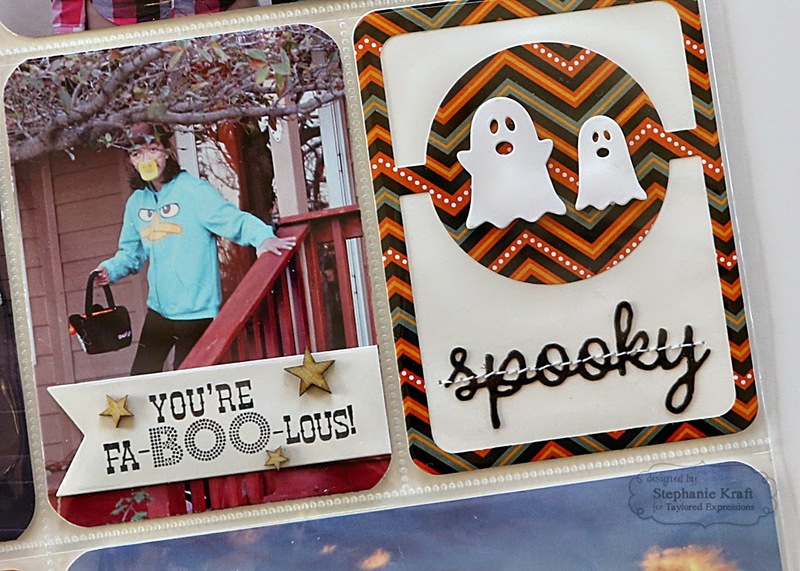 is from the stamp set, Fa-BOO-lous! and was stamped onto a Banner Stacklets 1 die. The filler card next to it was made with Little Bits - Ghosts, Pockets & Pages - 3x4 Circle Showcase and Pockets & Pages - October Script. The patterned paper is also from the Hocus Pocus 6x6 Paper Pack. The final detail shot is of the sunset that night. 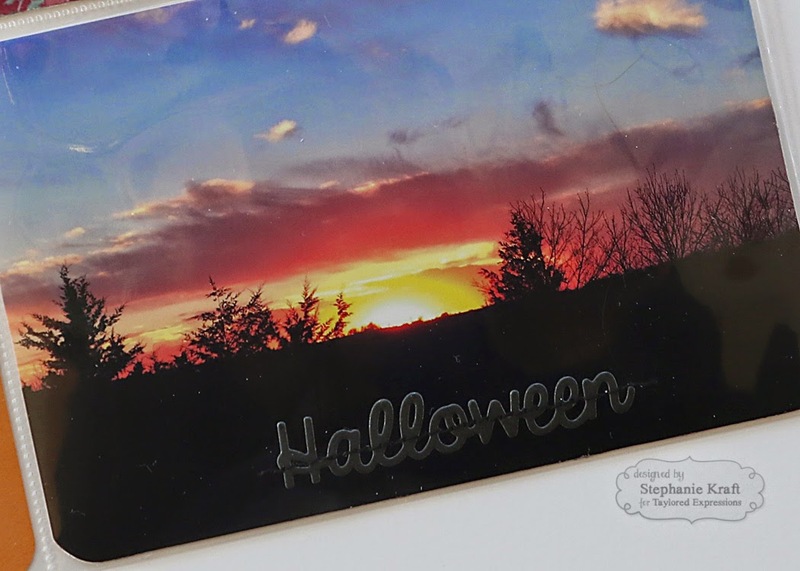 "Halloween" was die cut from Pockets & Pages - October Script and stitched on to the photo with black thread. Accessories: Taylored Dies: Banner Stacklets 1, Little Bits - Ghosts, Pockets & Pages Essentials - 3x4, Pockets & Pages Banner w/ Bonus, Pockets & Pages - October Script, Pockets & Pages - 3x4 Circle Showcase; Hocus Pocus sequins (TE); Journaling card from Kiwi Edition (Project Life), Wood veneer stars (Studio Calico), Photo overlay (Simple Stories), Grid Labels No. 1 (Cathy Zielske), Corny Candy washi tape (Doodlebug), Foam tape, Thread, Sewing machine. Note: Project Life is a simplified way to document everyday life and was created by Becky Higgins. To see all of my Project Life posts, click HERE. Great photos Stephanie! Love all the little details! What great memories to treasure!